Sample Southern Africa's stunning scenery, culture and wildlife on this incredible package. Upon arrival at Cape Town Airport you will be met by a Lion World Travel representative and transferred to the Commodore Hotel. The 4-star Commodore Hotel exemplifies deluxe accommodation, stylish living and quality service, overlooking the Victoria and Alfred Waterfront, with views of Table Mountain, Robben Island, the harbor and the Atlantic Ocean. Well situated just a short walk from the vibrant Waterfront that offers shopping, entertainment and a multitude of restaurants. All rooms have individual air conditioning, tea and coffee making facilities, hair dryers, 24-hour room service and personalized safes. Today is at leisure. To enhance your Cape Town experience, we recommend you enjoy a sightseeing tour and one of our experienced Africa Specialists will be happy to assist in advising you on which tours may suit your interests. Click here to see all of the day tour options that Lion World Travel has to offer. Cape Town is the most popular destination in South Africa due to its good climate, culture and scenic beauty. The city has several well-known natural features that attract tourists, most notably Table Mountain, for panoramic views of the city. Cape Point at the end of the Cape Peninsula offers dramatic views of the ocean below the cliffs. Your stay includes dinner at The Quarterdeck Restaurant on one of the evenings. The Quarterdeck is in the Portswood Hotel adjoining The Commodore and serves a delicious Cape Malay Meal. A day at leisure to enjoy sightseeing tours or explore on your own. Cape Town is a city with a diverse range of attractions, sights and activities to offer and has something for everyone, offering a myriad of things to do and places to see, whatever your tastes, inclinations or budget. Your final day in Cape Town! Time to do some last minute shopping or enjoy another sightseeing tour – time spent in Cape Town will not be forgotten. Today after breakfast, you will be transferred to Cape Town Airport for your flight to Oliver Tambo International Airport. Upon arrival, you will be transferred by road to Bakubung Bush Lodge in the malaria-free Pilanesberg National Park. The 4-star Bakubung Bush Lodge is a two-hour drive from Johannesburg and ten minutes from Sun City. This is a place of breath-taking beauty and serenity. Concealed in the rich expanses of the malaria-free Pilanesberg National Park, Bakubung, or “People of the Hippo”, offers everything one would need to get in touch with the bush. All rooms are air-conditioned, televisions with DStv, en-suite bathrooms, electric shaving plugs, coffee/tea making machines and a hair dryer. The Pilanesberg National Park is home to a large selection of animal and bird life including the Big Five. The Pilanesberg Mountains offer guests sightings of a wide diversity of wildlife including lions, elephants, white and black rhinos, buffalos, leopards, zebras, hyenas, giraffes, hippos and crocodiles. Unlike any other large park, the Pilanesberg Game Reserve is unique with overlaps of mammals, birds and vegetation. The colorful hues, varied habitats and panoramas will delight and entertain photographers and visitors. The very topography makes the area a feast for the eye. Thickly forested ravines, typical bushveld, rolling grasslands and lightly wooded areas can all be found here. This afternoon enjoy your first safari as you venture out into the reserve in search of wildlife! Spend two days exploring Bakubung where daily game drives reveal the fascinating world of Africa’s freely roaming wildlife. The day starts early as dawn breaks over the African bushveld. Enjoy a hot drink and breakfast before you depart in your open safari vehicle with your experienced rangers who will share their extensive knowledge of the bush with you. After an exhilarating hunt for tracks to see what the animals have been up to during the night, and tracking down wildlife in the bush, you continue your game drive en route back to the lodge. The remainder of your day is free. Spend the afternoon at the lodge, relishing the tranquility of the bush. You may arrange an additional afternoon game drive (your own account), or perhaps take the shuttle (your own account) over to Sun City, a 10-minute drive away. There’s much to do, see and experience at the Sun City Resort which provides a different experience to your safari. Two world-class golf courses have been played by legends of the game, like Jack Nicklaus and Tiger Woods. Get your pulses racing with a trip on the fastest zip slide in the world or a 4x4 quad-bike experience through the game park? Get your gaming kicks at the casino or stretch out on the beach at the Valley of Waves, while the kids tire themselves out on the water slides. Transfer back to Johannesburg for one night at the urban, contemporary 4-star Protea Hotel Fire & Ice! Melrose Arch is a hot-spot in the trendy Melrose Arch Precinct, Johannesburg a unique city within a city, which boasts a variety of fashionable retail shops, gourmet restaurants & leisure amenities. This modern hotel guarantees to spice-up any visit to Johannesburg and perfect if you enjoy being amidst an energetic urban atmosphere. They offer friendly and personalized service, an extremely quirky character, an excellent gourmet restaurant and a myriad of exciting things to keep you busy! All the stylish guestrooms are furnished in an urban style that will take you back to a bygone era of old Hollywood glamour. There are laptop-compatible safes and coffee/tea makers. Guests can use the in-room complimentary wireless high-speed Internet access. Rooms are equipped with LCD TVs with satellite channels and are air-conditioned, with desks and phones. Bathrooms offer showers, hair dryers, and complimentary toiletries. Fly to Victoria Falls and transfer to your hotel, the Victoria Falls Safari lodge located just 2 ½ miles from the Victoria Falls. Victoria Falls Safari Lodge provides luxury 4-star accommodation in Victoria Falls. Set high on a natural plateau, with uninterrupted views of spectacular African sunsets the Victoria Falls Safari Lodge borders the Zambezi National Park and is just 2 ½ miles from the thundering Victoria Falls. All standard en-suite guest rooms have a balcony overlooking the National Park, digital safes, remote control air conditioning, hairdryers, fans, mosquito nets, an extensive range of customized toiletries and complimentary tea and coffee making facilities. Wireless Internet access is also available from all rooms and public areas. At sundown enjoy a cocktail whilst watching game congregate at the waterhole. For dinner, move upstairs to the candlelit Makuwa-Kuwa Restaurant or experience the traditional food and atmosphere of the outdoor Boma Restaurant. Enjoy Dinner at the Makuwa-Kuwa Restaurant. Enjoy a guided tour of Victoria Falls through the magnificent rain forest, view the Cataracts and Livingstone's statue. Later enjoy a tranquil sunset cruise on the Zambezi River. Tonight savour a traditional African dinner and entertainment experience at The Boma Restaurant. Styled in the traditional manner, the thatched boma has an open fire to enhance the vibrant atmosphere. Specializing in a superb selection of traditional dishes. Traditional customs such as local beer tasting, and pre-dinner hand washing are observed, while the sights and sounds of the evening are accentuated by Ndebele performers who captivate diners with their colorful and energetic songs and dance. Steeped in mystery a witchdoctor adds a touch of drama and after-dinner guests are invited to while away the evening with the restaurant’s Sangoma - a traditional story teller - to learn more about the country’s folklore, culture and heritage. After you have savored dinner, you will be transferred back to your hotel. Experience a fabulous blend of luxury tented accommodations, game drives, river cruises and the impressive Victoria Falls for an exciting add-on! Victoria Falls in Style is a 3-night package. Spend one night in Johannesburg and enjoy two nights in Victoria Falls staying in a stunning tented lodge on the Zambezi River where you will experience the wonder of the mighty Falls as well as a tranquil cruise on the Zambezi River and open-vehicle game drives in the Zambezi National Park. Cape Town, the Mother City, is a historically, culturally and breathtakingly vibrant city that was recently named the best city in Africa and the second best city in the world by Condé Nast Traveller. From its beautiful natural landmarks to its colourful culture; from decadent wine farms to captivating history and architecture - it’s a tourist heaven. There’s no finer way to savor Cape Town's pleasures than a guided day tour with Thompsons Africa – from wonderful winelands and wine tastings, to riding the cable car to the top of Table Mountain, we’ll take you there in style. Please note the scheduled tour prices below have additional drop off and pick up points and will have other guests on board. The private tour pricing offers a vehicle and driver just for your use and allows more flexibility – please note that the venues visited will have other guests, it is just the vehicle and driver that is on a private basis. Pricing for both is per person based on a minimum of two people. Click here for day tour prices. Departs: Daily between 7:35 and 8:30am. Returns: Approx. 12:30pm. This tour is designed to orientate and give you a full-color insight into the extraordinary magic of Cape Town. First enjoy a cable car ride to the summit of the legendary Table Mountain (weather permitting) for panoramic views, including the City and surrounding layout of this southernmost tip of Africa (tickets are for your own account). Next up is a visit of the country’s oldest colonial building, The Cape Castle and the Company Gardens. Then you’ll be driven past Parliament Buildings, City Hall which is where Nelson Mandela made his first public speech after his release from prison and the Slave Lodge. Next, it’s up the cobblestoned hills to the beautifully colorful homes of the Bo-Kaap in the Malay Quarter. The tour ends on a sparkling note, with a visit to a diamond works where you’ll watch a professional diamond cutter as he creates every girl’s dream stone. Perhaps you’ll be taking one home. Departs: Daily between 8:00 and 8:45am. Returns: Approx. 12:30pm. The Cape Peninsula and Cape Point is wild, rugged, and undoubtedly one of the most memorable coastlines you’ll have encountered. The trip begins with a drive along Millionaires Paradise, eyeing the glamorous homes of Clifton Beach and Camps Bay which leave you in no doubt as to how it earned its title. From there, it’s on towards the charming coastal town and working harbor of Hout Bay - translated from Dutch it literally means Wood Bay. Then, driving over the legendary Chapman’s Peak Drive with its breathtaking views you’ll arrive at the Cape of Good Hope Section of the Table Mountain National Park and its rugged, intriguing landscape. Next up is a visit to the delightful African penguin colony at Boulders beach (for your own account, approximately USD $5 per person), before moving on to the historical naval port of Simon’s Town. It’s a wonderful half-day spent on the wilder side of this exquisite Cape coastline. Departs: Mon-Sat between 12:45 and 1:45pm. Returns: Approx. 5:30pm. Stellenbosch, with its Cape Dutch architecture, is the warm and wonderful heart of the Cape Winelands and is surrounded by stunning wine estates. It’s truly the prettiest town, home to one of the country’s prestigious universities, and you’ll love exploring the fine art galleries, the architecture, the history, and the curious and quaint shops. You’ll be taken on a leisurely drive to become acquainted with the area, before being introduced to the wine-making process in a fascinating cellar tour. Of course, you‘ll have a chance to taste the wine for which this area is renowned, and no doubt, you’ll leave with a favorite bottle or two under your arm. Stellenbosch is arguably one of the Province’s most beautiful towns. Experience the wonderful raw energy of Cape Town's Townships in one unforgettable morning. After a visit to District Six (closed on Sundays), where you will learn a little of the history of the townships, the tour continues on to the oldest township in Cape Town, Langa, and its people. Strolling through Langa Township, pop in to a local market, an Arts & Crafts center and visit a traditional healer. Experience the warm hospitality at a local Bed & Breakfast as well as a day care center that provides local children with a safe haven and fun environment. Then from Langa you will visit two other townships, Khayelitsha and Gugulethu to get a more in-depth look at the vibrant communities. For those who have the time, we recommend you extend to a full day tour with a visit to Robben Island in the afternoon. Home of Nelson Mandela for so many years, it’s a highly charged and emotional moment when you visit the site of this suffering, and realize how far South Africa has come from those days. Board the Robben Island Ferry at the Victoria and Alfred Waterfront and take part in a half day Robben Island tour. For nearly 400 years, Robben Island was a place of banishment, exile, isolation and imprisonment for political "troublemakers" and social outcasts. During the apartheid years Robben Island became internationally known for its institutional brutality. Some freedom fighters spent more than a quarter of a century in prison for their beliefs. Nelson Mandela was one of them. Those imprisoned on the Island succeeded on a psychological and political level in turning a prison 'hell-hole' into a symbol of freedom and personal liberation. Robben Island came to symbolize, not only for South Africa and the African continent, but also for the entire world, the triumph of the human spirit over enormous hardship and adversity. You will be escorted around the island by an ex-political prisoner, and given insight into the past and how the human spirit triumphs. Departs: Mon, Wed, Fri between 12:45 and 1:45pm. Returns: Approx. 5:30pm. This entertaining, family-friendly trip includes a visit to the Hout Bay World of Birds where adults and children can get up close and personal with nature, with over 400 different species to discover including birds, reptiles, mammals - don’t forget to visit the walk through monkey jungle! The tour continues with some of the finest beach views on the coastal drive to the Two Oceans Aquarium in the famous Victoria & Alfred Waterfront, where a magical underwater world awaits. Learn about mysterious deep sea creatures, dangerous predators and see a real “happy feet” family. Touch pools and tidal walks are part of the fun while puppet shows and play areas are on offer for younger children. For older children, fascinating discoveries, interesting facts, and shark encounters await! Bring your family on this fun tour to see, touch, learn and play...who knows, they may even find Nemo! Departs: subject to chef's availability. Today you will be picked up at 08h30 for your Cape Malay Cooking with Cass Abrahams Tour. Cass is the foremost authority on the cuisine in the Cape and is a local celebrity. The tour starts with a chat and a coffee with your guide so that you have some background on the people of the Cape, the history of their cuisine and on Cass. Cass realized that for a variety of reasons the cuisine was dying out in the Cape and made it her mission to rescue the recipes. She interviewed the grandmothers in the community and dug in the archives and then wrote a cookbook that became highly sort after by many South Africans. Today you have the opportunity to enjoy a hands-on class with her in her home in the Southern Suburbs. You will cook three to four dishes and then relax over lunch. Please note that no alcohol is served in respect for Cass's Muslim faith. Departs: daily, subject to weather. Please note the tour excludes transport to and from Simon's Town — prices available upon request. Visit one of the most unique places in the world — a penguin colony in suburban Cape Town. And the best way to see it is from the water. Leave from Simon's Town Waterfront and paddle past the civilian and Naval Harbor and out to Boulder's Beach. After visiting the penguins, stop on a lovely semi-private beach for refreshments, swimming and snorkeling (snorkels and bottled drinking water are provided). Your double kayak is very stable and perfect even if you have no paddling experience. We can also arrange for you to go cycling, skydiving, sandboarding and abseiling among other activities — please let us know if you would like more information on these activities. Departs: Mon-Sat between 8:00 and 9:00am. Returns: Approx. 5:30pm. This is a superb day exploring the exceptional Winelands region with its heavenly scenery. The area is rich with history, and you can’t help but feel it as you visit this region. Experience a wine cellar tour, where you’ll learn all about the process of winemaking, and have the chance to savor the wines. Visit the charming little town of Franschhoek, pass by the impressive Huguenot Monument, and enjoy lunch (your own account) – the town is known as the gourmet capital of South Africa. After lunch, the tour takes you over the Helshoogte Mountain Pass to the pretty university town of Stellenbosch. You will have time to stroll through this little town, absorbing the quaintness, and enjoying the shops! A trip to the Winelands isn’t complete without a wine tasting, so you'll visit two different wine estates. During your visit, you’ll be able to purchase your favourite wine to take back home! Departs: Wed, Fri & Sun between 7:45 and 8:45am. Returns: Approx. 5:00pm. The quiet little fishing village of Hermanus has the best shore-based whale watching in the world! The drive takes you along the coast with its glorious ocean view and hopefully – the awe-inspiring site of Southern Right whales at play. There may be an opportunity to join boat-based whale watching (subject to availability, time and weather conditions and for your own account – approximately USD $50 per person and the cruise lasts about 2 and a half hours). You will be able to enjoy lunch in the town (your own account) if you choose not to do the boat trip. The day also includes a visit to the Hemel-On-Aarde (Heaven & Earth) valley to visit a boutique winery to sample some wines of outstanding quality (on Sundays when the winery is closed you will visit the Cheetah Sanctuary in Somerset West instead). The return drive to Cape Town takes you via the pretty apple-growing region of Elgin and through Sir Lowry’s Pass with its spectacular views. Departs: Daily between 7:45 and 8:45am. Returns: Approx. 6:00pm. On this tour you will see why the area earned the name of The Fairest Cape. Sit back and relax, as you’re driven along the exquisite stretch of coastline known as Millionaire’s Paradise – from Clifton to Camps Bay, to the exclusive beach hamlet of Llandudno – towards the charming working harbour of Hout Bay. You then wind your way along the legendary Chapman’s Peak Drive, hugging the cliffs and relishing the breathtaking ocean views. After a stop for lunch (your own account), visit the wild and beautiful Cape of Good Hope Section of the Table Mountain National Park, an integral part of the world-renowned Cape Floral Kingdom. After, you'll head back along the coast towards the City, visiting the historic naval port of Simon’s Town and the endearing African penguin colony at Boulder’s Beach (own account – approximately USD $5 per person). Next, you’ll head inland to the last stop of the day. In the summer months this will be at Kirstenbosch Botanical Gardens. With the sun setting over the tall peaks of Table Mountain, the last rays sparkle on the trees and flowers. In the winter months (May 1st to Aug 31st), the last stop is at Groot Constantia where you’ll stop for a wine tasting and cellar tour of South Africa’s oldest wine estate. Departs: Tue & Thu between 5:30 and 6:00pm. Returns: Approx. 10:00pm. Join your host and head out of the city before sunset. Savor a chilled glass of sparkling wine while overlooking one of Cape Town’s most beautiful beaches and taking in the sunset. You’ll be shown how to find the Southern Cross in the night sky (if the moon isn’t too bright! ), before enjoying dinner at a sensational restaurant offering seafood and South African specialties. If you’re celebrating a special occasion let us know and we can arrange a separate table. As you return to the hotel, you'll enjoy the city lights by night. Departs: daily subject to weather conditions — times vary according to sunset. Board a sail boat that will follow the wind for this cruise and allow you to experience sunset and the views of Cape Town at dusk from a different perspective! Typically in a SE Wind direction, you will head out of the Harbour and sail across Table Bay towards Milnerton lighthouse, then return to the protection of Granger Bay in the lee of Table Mountain to watch the sun set, and then motor back to the Waterfront. We can also tailor make tours to match your interests or simply arrange for you to have a vehicle and driver available with no plan in mind to take you wherever you feel like going. Cape Town has been chosen as the Design Capital for 2014, we can include Architecture, Art, local clothing designers. In addition to the beautiful Winelands, Cape Point and City tours, consider a family day out, to see seals, penguins, monkeys and butterflies; splash out on a hot shopping extravaganza; or indulge in a grand gourmet food and wine tour of golf or bicycle tours. Half day private trips depart daily on request and run from either 8:30 am to 12:30pm or 1:30pm to 5:30pm and cover up to 150km’s. The full day private vehicle and driver hire departs daily on request with a pick up time of 9:00am, dropping off at 5:30pm and covers up to 250km's. Both half and full day options exclude all entrances, parking fees, toll fees and any other costs which you would need to settle directly at the venues visited and in the case of parking, with the driver. Touring is done in an air-conditioned 7-seater vehicle with a tour guide. We strongly recommend that you purchase travel insurance. Your Africa Specialist will be able to direct you to information regarding travel insurance. Prices are per person in US Dollars, for land arrangements only, based on double occupancy accommodations. 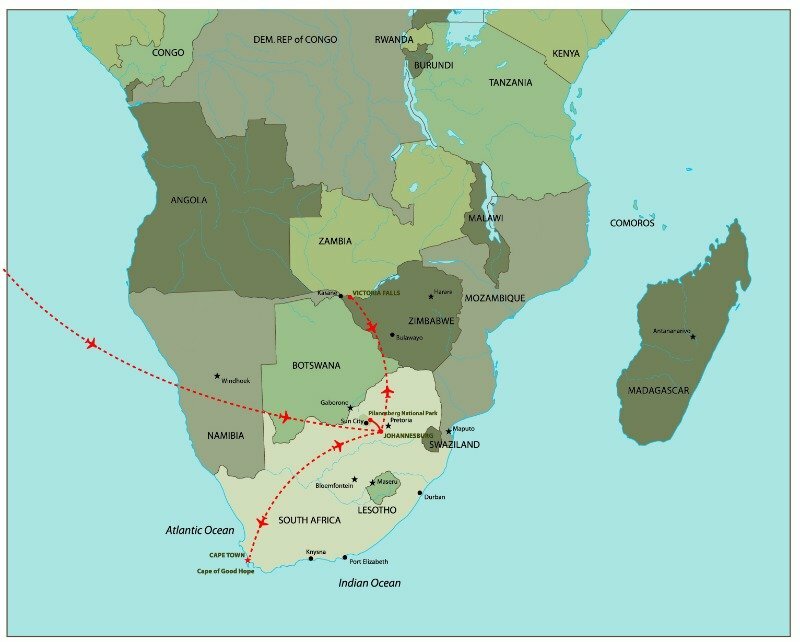 2019 internal air arrangements, economy class per person US$999 for: Cape Town-Johannesburg-Victoria Falls-Johannesburg. Items of a personal nature such as drinks, laundry, telephone calls, etc. Trip cancellation, interruption and/or medical insurance – please note that insurance for this trip is a mandatory requirement from suppliers in Southern Africa – proof of insurance must be provided before bookings are confirmed. It is your personal responsibility to ensure you have sufficient insurance coverage. Click here for airline baggage restrictions. Explore the "best" of beautiful Cape Town, the picturesque Winelands and a thrilling safari.